The earliest series-The Jolly Good Times Series' heroine Millie was supposed to be Mrs. Smith as a girl. The Young Puritan Series and the Old Deerfield Series were books based to a degree on stories handed down from generation to generation beginning with her Puritan descendants. Mary Prudence Wells was born in Attica, New York in 1840. 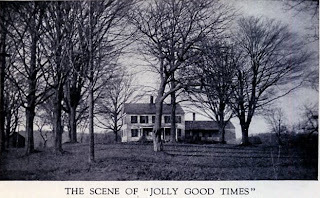 She moved with her family to the Kendall Farm in Greenfield Meadows, Massachusetts. Her first published effort was a piece she submitted to the Springfield Republican in 1858. It was entitled "Trials of a Tall Young Lady". She sent it in with the pseudonym of P. Thorne. When asked, she noted the name had no special significance. In 1874 Jolly Good Times appeared in serialized form in the Christian Union. In 1874 it was published in book form by Roberts Brothers. In fact, Roberts Borothers published all of her works until Little, Brown and Company purchased all the Roberts Brothers' plates in the late 1890's. Beside her books she penned a number of stories and essays for magazines including Harper's. 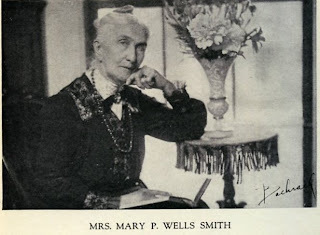 In 1875 Mary P. Wells married Fayette Smith and moved to Cincinnati with her lawyer husband. 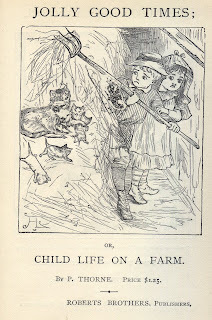 Smith was a widower and his four children and the later addition of her daughter Agnes (who died at the age of fourteen) gave Smith lots of new book material. In 1896 her husband retired and the family moved back east to Greenfield, Massachusetts. It is at that time that she began to work on the material which would become the Old Deerfield Series and the Young Puritans Series. She was also active in the local community. Wells was Honorary President at the All Souls' Church in Greenfield in 1894. Is any of this available in facsimile edition? The post is absolutely fantastic! Lots of great information and inspiration both of which we all need! Also like to admire the time and effort you put into your blog and detailed information you offer!